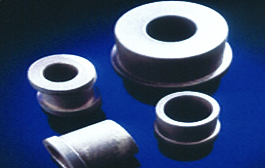 TETRON B is the trade name for bronze-filled polytetrafluorethylene (PTFE). Bronze is a copper and tin alloy providing better creep resistance than most of the PTFE alloys. It is often used in hydraulic systems but is not suited to electrical applications. Bronze is also attacked by certain chemicals. The product has a dark brown colour, a non-oxidizing alloy is used for good appearance. Tetron B is available in sheet, rod and tube.